In the drive to rebuild the Luftwaffe there seemed to be no real interest in developing a radio ranging device other than one to guide bombers to their target. Their focus was on developing offensive systems and it was only threatened nations, such as Britain, that felt an overriding need to counter the air threat. The British navy, on the other hand, was clearly superior to the German navy causing Germany to search for technological solutions to blunt the British naval superiority and prevent naval attacks. It is no surprise then that the German navy developed several of the best pre-war radar systems. Dr. Rudolph Kühnold, head of the German Navy’s signals research, rediscovered German radar in 1933. He was working on how to detect underwater objects by bouncing sound waves off of objects, sonar. It occurred to him that the same principles could be applied to radio waves above the water. Twenty-nine years after Hülsmeyer’s work in radar, Kühnold (ignorant of Hülsmeyer’s work) recreated his effort. In January 1934 the Gema company began development of this experimental radar and it was demonstrated on March 20th in Kiel harbour. Later that year, Kühnold successfully demonstrated his apparatus to naval officials spotting ships over seven miles away and, by chance, spotted a seaplane moving in front of the radar. Naval officials were impressed and granted development funds to the Gema company. Kühnold improved his experimental radar with pulsed transmissions to measure target ranges and higher frequencies resulting in a useable prototype for the navy. In September 1935 Admiral Raeder, the German Navy’s Commander-in-Chief, observed demonstrations of the radar’s ability to spot from a fixed shore location ships at a range of twelve miles and the capability to detect ships from a moving ship-borne location at a range of five miles. From here the Gema company rapidly improved the prototype by altering of the frequency used which extended its range and accuracy. These improvements gave the new radar the ability to spot aircraft as well as ships. 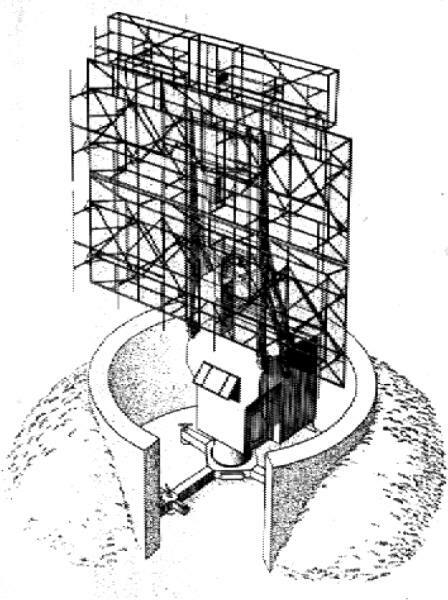 This system would become the most important German early-warning radar and demonstrated an aircraft detection range of fifty miles at the end of 1936 garnering orders from both the Luftwaffe and navy. This radar, named Freya, was delivered to the German navy in 1938. Freya had excelled in the unexpected area of aircraft detection, but the navy was more interested in the creation of highly accurate gun ranging for its ships. Gema was able to build a higher frequency, 375 megacycles, short range, up to nine miles, gun ranging radar. This radar, named Seetakt, was undergoing ship trials in 1937 and was spotted in use on the pocket battleship, Graf Spee, in 1938 during its intervention in the Spanish Civil War. Telefunken, which had been disinterested in the pursuit of radar in early 1930’s, became interested when the upstart Gema company landed substantial military contracts. Telefunken entered into the radar field in 1936 and was able to develop a small, highly mobile radar set with the ability to plot aircraft with high levels of accuracy up to ranges of twenty-five miles. This radar, named Würzburg, was produced in 1938 using an extremely high frequency, of 560 megacycles, for the time. This radar was accurate enough to meet the needs of anti-aircraft gunners, and allowed ground-directed aircraft intercept missions at night. Telefunken, at the same time, was developing small airborne radar sets which were being installed on Junkers 52 transport aircraft for testing. German industry in developing naval surface radar had unwittingly discovered the makings of modern air defence systems. There is no real evidence that the Luftwaffe ever pursued radar as a needed defensive device, but, once demonstrated, it purchased the units without much further thought to command and control issues. 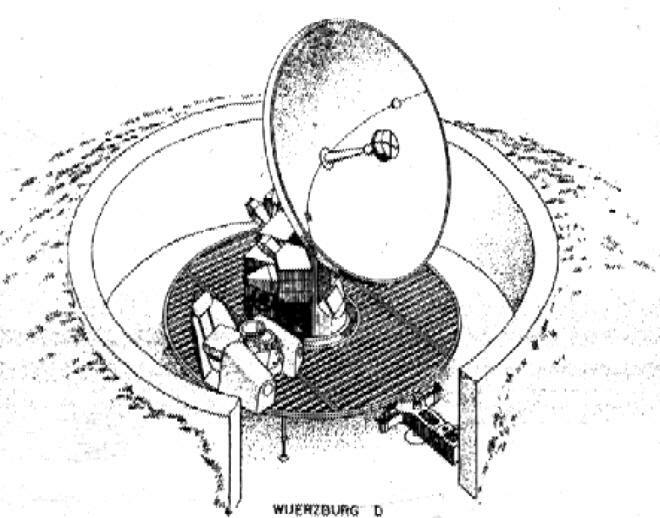 The combination of the Freya and Würzburg radar was especially powerful. Freya could be used in the classic role of a ground based search radar giving long-range early warning, and Würzburg could act as the acquisition radar for defensive weapons systems, whether it was a searchlight, anti-aircraft battery, or the vectoring of fighter aircraft. In the autumn of 1939, Germany had eight Freya stations, two on Heligoland, two on Wangerooge, one on Borkum, and one on Norderey primarily to cover the coastline between Holland and Denmark against naval threats. On 18 December 1939, Freya radar spotted twenty-four RAF Wellingtons on a mission to bomb German naval shipping at Wilhelmshaven. The radar unit alerted fighter aircraft at Jever and sixteen Messerschmitt 110’s and thirty-four Messerschmitt 109’s caught the British on their way home. Fourteen Wellingtons were shot down and the RAF essentially gave up its doctrine of daylight bombing, switching to night bombardment. Göring and the Luftwaffe had essentially overlooked the threat of strategic bombing and the complexities of defeating bomber formations at night. Göring was so impressed with the Würzburg radar that in August of 1939 he declared that the Ruhr would not be exposed to one single enemy bomb. He was excited by the fact that Würzburg gave him the ability to target and shoot down enemy aircraft regardless of the weather. The importance of this radar can be easily shown in the difficulty of shooting down an aircraft from the ground. The German’s best anti-aircraft gun was the 88-millimeter Flak, which was capable of firing a shell 9,000 yards. It took twenty-five seconds for the shell to reach its maximum range and, in that time, the aircraft could travel nearly two miles. The gunner had to use an optical site, with good visibility, on the intended target to even have a chance of hitting the aircraft. Radar guided anti-aircraft fire was a quantum improvement in their efforts to counter British raiders. The promise of technology and the reality were two different things. The Luftwaffe had accepted the equipment, but had never developed strategies to employ it. There is sufficient evidence that the German High Command knew the potential value of radar as an aircraft detection device as early as 1935. However, they viewed radar as primarily a gun sighting aid for flak and searchlight control. For these reasons, radar was initially assigned to flak units. General Wolfgang Martini, Luftwaffe chief of radio signals, after the war strongly stated that he realized the value of radar for aircraft warning and fighter control, but the high staff was unconvinced of his arguments. The staff was committed to the popular Blitzkrieg theory and discounted the need for air defence. It was not until July 1940 when Göring appointed Colonel Josef Kammhuber, later promoted to Major General, that an effective defence against the night bombers was established. He was able to develop effective command and control strategies for air defence. Kammhuber redeployed the radar and searchlights away from the cities into a line which the RAF named, the ‘Kammhuber line’, paralleling the coast. Along this line he set up air defence boxes, Himmelbett, which contained their own radar, searchlights, anti-aircraft artillery and fighter aircraft. This system was continuously updated throughout the war and was able to provide a credible bomber defence for the duration of the war. On the offensive side, the Luftwaffe pursued radio and radar aids to bombing and navigation as a greater priority. The lessons of Spain proved the inefficiency of strategic bombing without accurate bombing aids. The Germans anticipated the problem of target finding and developed three electronic navigation and bombing aids. The German systems were Knickebein (‘Bent Leg’), X-Gerät (‘X-apparatus’), and Y-Gerät (‘Y-apparatus’). Because of these systems, the Germans were able to switch from day to night bombing without the loss of accuracy that Bomber Command later experienced. Knickebein, Germany’s first navigational bombing aid, was originally developed in the 1930’s as an aircraft blind landing aid. It transmitted a beam in the 30 megahertz range composed of audible dots on one side and dashes on the other. The pilot flew along the beam with a solid tone marking the centre. Another beam was transmitted to mark the approach to and arrival over the target. The system was only theoretically accurate to within a kilometre and was susceptible to cockpit sounds and noise jamming. The X-Gerät system worked along the same principles, but introduced several improvements. It operated at a higher and more accurate frequency of 65/75 megahertz, used a mechanical indicator which was less susceptible to noise jamming, and provided an extra beam to calculate ground speed and determine bomb release. The theoretical accuracy of X-Gerät was improved to several hundred meters, but required the bomber crew to maintain a constant course, speed and altitude to achieve this result, something that was hard to accomplish in the heat of battle. The final system Y-Gerät was the most sophisticated yet, but suffered from its own complexity. This system combined a radio beam with a modulated signal which measured distance. Theoretically, this system was very accurate, pin-pointing the exact location of the bomber and commanding the precise moment of bomb release. Unfortunately, the complexity of the modulated signal made it an easy target for jamming and the system never realized its potential in combat. Of the three systems X-Gerät seemed to be the most successful for the Germans. It was the least affected by jamming and provide a reasonable amount of accuracy. Probably the most significant achievement of the X-Gerät system was during November 1940 with the successful raids on Coventry. Popular post-war accounts speculated that Winston Churchill knew about the coming raids on Coventry from Enigma intelligence and elected not to evacuate the population to protect Enigma. More reliable sources contend that this story was pure fiction and that they never really solved how to adequately jam the X-Gerät signal to prevent the results at Coventry. It is remarkable that the Luftwaffe which was so closely linked to tactical bombing developed these accurate navigation and bombing aids prior to the beginning of the war. The British strategic bombing emphasis failed to foresee this requirement and did not deploy it first navigation system, Gee, until March of 1942.